Do you know you can read already deleted messages in Whatsapp even if you are using an Android device or an iOS Phone? Whatsapp biggest update was based on deleting messages you mistakenly sent on whatsapp, probably in a group or to a contact, but what if we can see those messages the person is trying to hide, after all, we didn't tell the person not to think before sending messages. There is only one method to do this, some claim there are up to 4, but actually, it's one and this is the best way to read deleted messages on Whatsapp. There might be some applications that should have that option like GBWhatsapp but it isn't available now, so we await when it's available. This whatsapp bug revolves around WhatsApp backup feature which some utilizes, unlike me. You can use whatsapp backup feature to recover and read This Message Was Deleted' on Whatsapp, without much talking, here's how to do it. All your chats will be displayed | head to the deleted whatsapp message and you'll see instead of it displaying 'This Message Was Deleted', you'll see the actual message on your whatsapp app. First of all install Notisave application. After the installation is completed, click to open it. Also, enable "Accessibility settings" and "Notification Access" in your android mobile. After the settings are enabled, now you can recover deleted messages in your WhatsApp. 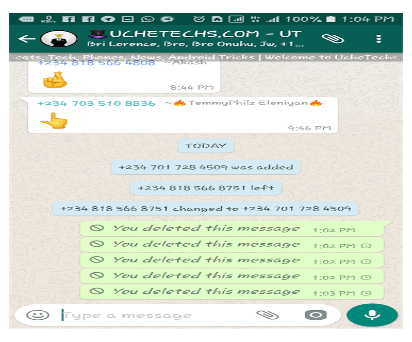 This is how you can easily recover and read deleted message on whatsapp without problems, be sure to allow the backup process to complete or you'll lose some messages and group chats. I know you will like to share this post on Facebook, use the below button which also includes other social media. Have a wonderful day. But it is worth it. Also, it came to my notice GBWhatsapp has this feature already which wasn't clear to us before.